Sometimes it is not necessary to drive too far from Moscow to taste the real Russia. A mere 25 minutes journey from the Kursky railway station will take you to the surroundings, quite different from those of the capital. Woeful roads, small wooden houses and people dressed in old-fashioned way make up the spirit of typical Russian countryside. The flea market at the Saltykovskaya train station (the town of Balashikha), which is located 9 km east from Moscow, is held every Sunday. 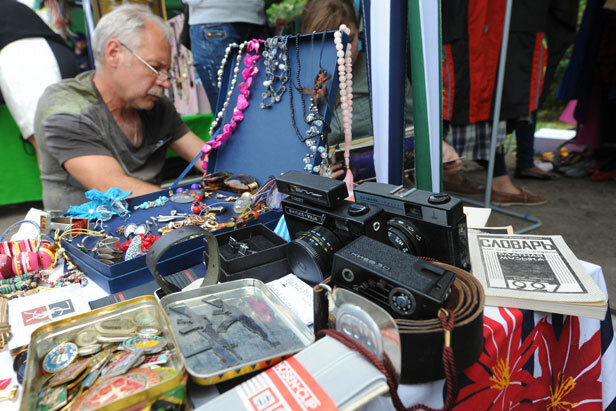 The locals are coming to sell a great variety of stuff, from used kitchen utensils and retro electronic devises to musical instruments, notalgic badges and posters from the Soviet times. For most vendors the weekly visit to the main square means the chance to communicate with each other and share their concerns. For them events like flea market seem to create the sence of belonging to the place, where they spend a lion’s share of their lives.